SAPPORO, Japan, May 11 (Xinhua) -- Chinese Premier Li Keqiang wrapped up his visit to Japan on Friday after Japanese Prime Minister Shinzo Abe bade farewell to him in person at the airport in Sapporo, capital of Japan's northern island of Hokkaido. Being marked by Li's visit, which succeeded in consolidating political mutual trust and exploring new cooperation possibilities between the two neighbors, bilateral ties are now on the right track again. Li's visit to Japan, the first by a Chinese premier in eight years, coincided with the 40th anniversary of the signing of China-Japan Treaty of Peace and Friendship. Abe displayed Japan's sincerity by accompanying Li during most of the events Li participated in both Tokyo and Sapporo. The Treaty of Peace and Friendship, an important milestone in bilateral ties, affirmed the principles of the bilateral joint statement that was issued in 1972 in legal form, which include Japan's deep reflection on war responsibilities, and its firm adherence to the One-China policy, Li told a reception marking the anniversary of the treaty held in Tokyo on Thursday. Now, new progress and lasting stable development should be made as bilateral ties return to the normal track, and this is the best way to commemorate the signing of the treaty, Li said. In the political area, China and Japan have agreed that they will use history as a mirror while keeping a future-oriented mind, Li noted. The Japanese government and leaders have on multiple occasions expressed willingness to face up to and reflect on history, Li told Abe during their talks on Wednesday, urging the Japanese side to fulfill its commitments with actions. The Chinese premier also asked both countries to properly manage disputes and jointly build a brighter future. "I hope that the two countries can meet each other halfway, and maintain long-term, healthy and stable growth of their ties," Li told Abe. During the visit, the two sides signed several cooperation documents including a memorandum of understanding (MoU) on setting up a maritime and air liaison mechanism, which is a crucial step in managing crisis in the East China Sea. Li said that the return of bilateral political ties onto the right track will be conducive to promoting their cooperation in other fields. The resumption of high-level visits has been highly expected. During the visit, Li invited Abe to visit China on a proper occasion, saying that exchange of visits between leaders of the two sides on a regular basis will create favorable conditions for the development of bilateral ties. Abe hailed Li's remarks that China-Japan relations are setting sail again and will sail further. The Japanese prime minister is also eager to see a revitalized and healthy relationship with China. He called on the two sides to turn competition into coordination, adding that, starting today, bilateral relations have entered the era of coordination. There will be no unconquerable difficulties for the two countries so long as they join hands with each other, Abe said. During the visit, China and Japan agreed to lift their pragmatic cooperation to a new level. The two sides have set out the direction and pinpointed new areas for future cooperation, reaching agreements on social security, finance, health, medical science and service trade, Li said. Calling on the two countries to synergize their development strategies, Li pointed to energy conservation, environmental protection, scientific and technological innovation, high-end manufacturing, finance, sharing economy, medical and old-age service as sectors where the two sides should focus on. Besides the goodwill, concrete steps are in sight as well. On Wednesday, Li and Abe witnessed the signing of memorandums on enhancing service trade cooperation, and on third-party cooperation between the two sides. In addition to a bilateral service trade cooperation mechanism, China and Japan also agreed to set up a cross-department work mechanism for promoting third-party market cooperation under the framework of the China-Japan high-level economic dialogue, and organize a forum on the third-party market cooperation. China also agreed to grant Japan RMB Qualified Foreign Institutional Investors (RQFII) quota of 200 billion yuan (about 31.36 billion U.S. dollars). The granting of the RQFII quota would help Japanese financial institutions actively invest in China's capital market through the RQFII, Li said. The two sides also agreed in principle to sign a currency swap deal at an early date, and this will help safeguard financial market stability and promote investment facilitation, Li said. On Friday morning, when visiting a factory of Japanese carmaker Toyota in Hokkaido, Li called for deepening bilateral cooperation on joint R&D and innovation so as to produce competitive high-tech goods that meet the demands of Chinese and Japanese markets and also third-party markets. On infrastructure building, Abe suggested that Japan and China set up a cross-department committee and a forum to promote cooperation on meeting Asia's infrastructure development demand. Business people of both sides can work together, especially within the framework of the Belt and Road Initiative and in jointly developing third-party market, said Sadayuki Sakakibara, chairman of Japan Business Federation. For his part, Yohei Kono, former speaker of the Japanese House of Representatives, said he was amazed by the popularity of new services like bike-sharing, mobile payment and Internet-based delivery during his recent visit to China. The progress made by China is worth learning from, said Kono, adding that China and Japan should learn from each other to achieve common prosperity and make joint contribution to the development of the world. During the visit, China and Japan also created conditions for stronger cooperation between localities and enterprises, and for better people-to-people links. 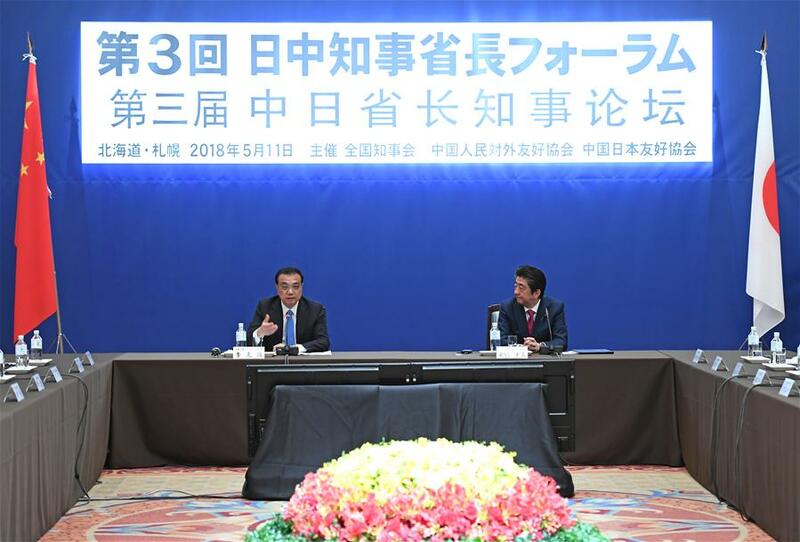 While addressing a China-Japan Governor Forum on Friday in Sapporo, Li said the two sides agreed to carry out cooperation in innovative development and launch innovative dialogue mechanism. Hokkaido not only is an important base of Japan's modern agriculture, but also has important high-tech industries. The two sides plan to enhance cooperation in high-tech and other industries concerning people's livelihoods such as dealing with population ageing and improving medical treatment, Li said. Exchanges and cooperation between localities are an important part of China-Japan relations, Li stressed. Meanwhile, to cement people-to-people bonds is a highlight of Li's visit. While meeting with some of the former Japanese politicians who had participated in the process of making the China-Japan Treaty of Peace and Friendship, Li called on both sides to cherish the hard-won momentum of improvement in bilateral relations and carry forward the spirit of the treaty. In Tokyo, Li and Abe jointly visited a cultural and creative exhibition of the Forbidden City, which showcases artworks of bronze, lacquer, porcelain and wood carving that draw inspiration from artifacts of the Forbidden City. Li asked to make cultural industry a new spotlight in bilateral cooperation, strengthen mutual understanding of the two peoples, and consolidate the public opinion basis for long-term, healthy and stable growth of ties. During the visit, China presented Japan with a pair of crested ibis to reflect Chinese people's friendship with the Japanese. The iconic bird is deeply rooted in Japanese history and culture. It was on the verge of extinction in Japan in the 1980s. Since then, the two countries have worked together to protect the bird. On various occasions, the Chinese premier stressed to cement people-to-people exchanges, consolidate the public foundation for bilateral ties, and strengthen understanding and affection between the two peoples. He was warmly welcomed and echoed by Japanese leaders. Japanese Emperor Akihito said he always recalls the moment when he was warmly welcomed by the Chinese people in his visit to China over 20 years ago, and strongly felt the hearts of the two peoples were connected. With efforts from both countries, their people-to-people bonds are expected to get even closer, and contribute to further improvement of the overall relations.